This issue of The Splash marks the forty third anniversary of our cornerstone publication. Yours truly has had the honor of editing this publication for the last fifteen years. I say honor because it has been. Not only an honor, but fun and challenging as well all rolled into one. 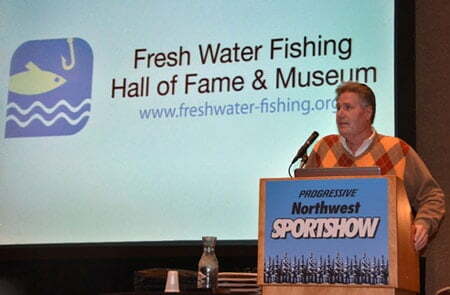 I believe The Splash also serves a vital function to the fresh water sportfishing community. It is our unique instrument in which we are substantially able to fulfill our core mission of “the international promotion of fresh water sportfishing.” By the way, the theme for this issue is “Friends Don’t Let Friends Fish Alone.” Our bookkeeper Vicki Musiala deftly came up with this tag line, as I was struggling to come up with a fitting sentiment along the friendship theme. Thank you Vic! I suspect you may hear this phrase from us again. Since the fall issue our weather in Hayward has been interesting. A fair amount of measureable snow in November, but it largely disappeared in December. In fact, we only technically had a white Christmas. It was a little bit of a stretch to call it white, but we did so mostly out of habit I suppose. A few weeks ago the snow gods opened up a bit and helped out the snowmobilers with enough to at lease get their sleds off the trailers. The lakes have also formed enough ice to accommodate almost any type of transportation. They did so later than normal even though we had ice earlier than normal. Go figure! Lots of ammunition for the climate change debate. And now the cold is upon us with a vengeance. It is 7 degrees right now. Tomorrow it is forecasted that at this time it will be 10 below. The various weather apps are reporting that next Wednesday the warmth of the sun will take us all the way up to 12 below! Time to break out the long johns and the poncho liners (Most of you vets remember those I’ll bet)!